ORLANDO, Fla. -- We wound day our day at the bar in the Capriccio restaurant where we learned that despite the preponderance of steak houses in the neighborhood, this is really horse country. A similar shift in perspective hit us during the first official day of PMA 2006. In our earlier piece (http://www.imaging-resource.com/EVENTS/PMAS06mrp/PMA.HTM), we reported our experience with Lensbaby 2.0, a lens that focuses only on a part of the whole field of view. As we walked the floor today, we had the feeling we were a human Lensbaby, focusing on just a narrow view of everything that was on display. Was it true Hewlett-Packard had introduced a 13x19-inch pigment printer after years of pushing dye-based inks? Had Bibble incorporated Noise Ninja in its latest release? Did Nikon really outfit its new Coolpix digim with an EasyShare printer insert, not to mention muvee software? 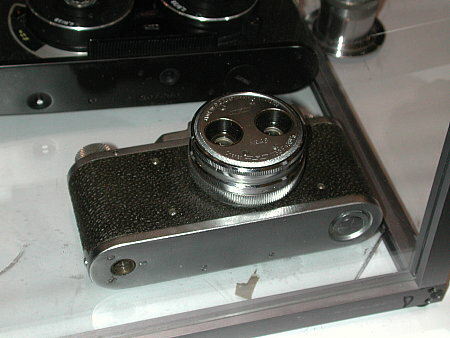 Was that ancient two-eyed camera we saw in the corner of the trade show floor the forerunner of Kodak's V570? Had iView MediaPro incorporated Adobe's XMP metadata structure? Had someone other than Olympus announced a Four Thirds camera? 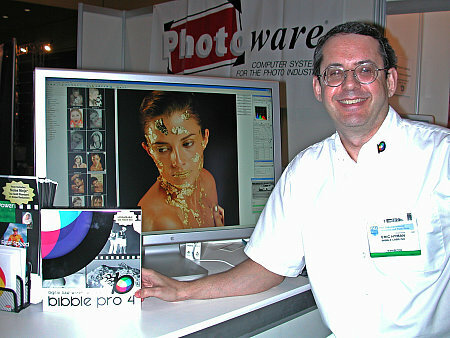 And Lexar has written a plug-in to copy card images with IPTC data directly into Bridge? What is going on here? We needed a little perspective. While the rest of the Imaging Resource crew was chasing down details of one or another announcement or shot video of the more important products, we wandered over to a special presentation by Hewlett Packard. The big news, as we reported yesterday, is the $699 Hewlett-Packard Photosmart B9180 13x19 pigment printer, which features 200 year print life, according to a Wilhelm study. Henry Wilhelm was there himself to confirm it and happened to mention he was happy to be alive to see it, too. See how the glare changes in the black area between the foreheads? Watching HP make peace with pigments was nearly entertaining. Wilhelm discussed the history of pigments in art, going all the way back to cave paintings and not skipping Joan Crawford's tri-chrome carbro on his way to the B9180. There were sample prints and testimonials but we found photographer Michael Fry's comments hit closest to home. When he evaluates a printer, he said, he looks for 1) deep, rich blacks so the image pops out, 2) the ability to produce rich, saturated colors, 3) the capacity to print subtle gradations in tone and color, 4) sharpness for detail, 5) permanence to reassure buyers, 6) color accuracy and consistency and 7) a close match to what he's produced on his monitor. Fry said he found the B9180 actually produced deeper blacks than the dye inks he's used. He admitted the color saturation isn't quite as intense as on the 8750, but it's still quite high. He was surprised he could be less aggressive with unsharp masking and still produce a sharp image, relying on the printer's hue accuracy to distinguish objects. His black and white prints (using the three-ink HP system) were neutral and exhibited smooth tonal gradations. He confessed to not being an ICC profile type of guy, but had printed the same file on different B9180s and gotten identical prints using a profile developed for yet another early unit by a third party. 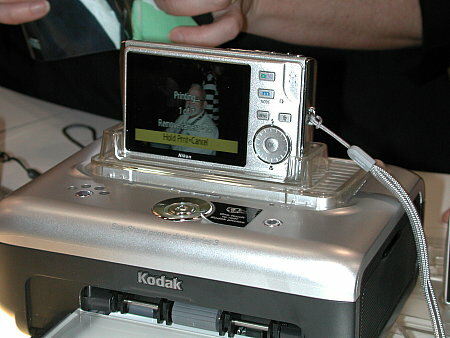 The B9180 features a three-level approach to color management. It starts with a closed loop calibration system in which you print a target and then feed it back into the scanner so it can read its own output to calibrate itself. Then there's some sophisticated print head management going on that is smart enough to compensate for closed nozzles, for example, or just tell you when it's time to replace the print head. 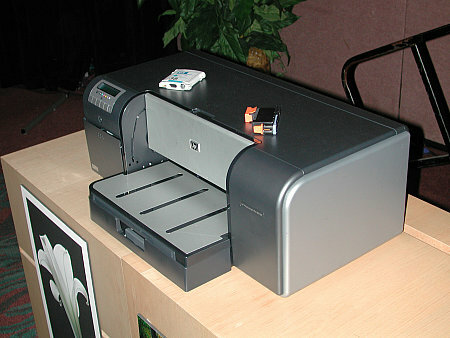 Unlike HP dye printers, the print head is separate from the ink cartridges, holding two ink cartridges each in the eight-ink system. Finally, HP has developed a Photoshop plug-in to simplify the print driver's color management options. Images right out of the printer are waterfast (permanent right from the start). And ink costs should run about 28 cents for a 4x6, roughly in line with other printers. We took a stroll around the perimeter of the trade show floor to review the booths least likely to be visited and found a couple of interesting ones. A booth packed with ancient gear was certainly one. 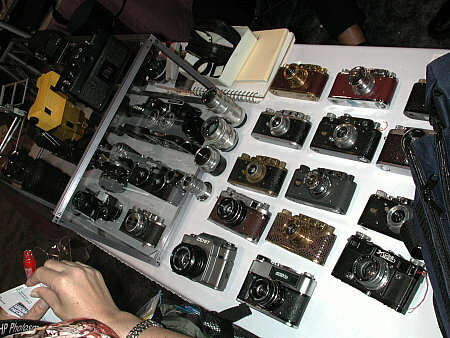 We thought we saw a Kodak V570 (http://www.imaging-resource.com/PRODS/V570/V570A.HTM) among the venerable Leica's. You be the judge. As if we weren't confused enough, we wandered over to the Bibble booth where Eric Hyman (the ibble behind Bibble) demoed the latest version, released just before the show. It includes Noise Ninja, which Eric has skillfully integrated into the Raw processing workflow as naturally as if it were a temperature or exposure setting. His demo was impressive, too. We're used to seeing even good noise reduction schemes obliterate detail. The sample image was a backlit view of a sunbather's back. The original was indeed unusually noisy. The model's right side was sunlit, so you could see the hairs on her arm. Noise Ninja did it's magic with the noise on her back but left the hairs pretty much alone. It wasn't a miracle cure, but it was a significant improvement. We were surprised to learn that Bibble does not support Adobe's DNG format, the open standard for Raw files. Eric explained he was not a fan of the format because it interpolates color between an incandescent and a daylight profile. He believes that's less precise than the lookup tables camera manufacturers prefer and is further annoyed that only Adobe knows how they build a profile between incandescent and daylight. He would have preferred Adobe had separated the Raw wrapper from the processing, in short. After years of marketing online, the company is about to sell a boxed version of Bibble. In about a month, look for it wherever photographers buy their gear. Shaken but not stirred, we decided to indulge in the afternoon's keynote. It was a double keynote, with Fujifilm President and CEO Shigetaka Komori speaking before Hewlett Packard Executive Vice President Vyomesh (VJ) Joshi. Komori made four points during his talk, which emphasized the fusion of analog and digital imaging rather than treating digital as a ticket to the future. First, the number of pictures being taken has increased, so the industry should make it a priority to see prints increase, too. Second, silver halide photo paper "can not be beat." Third, he promised continued support for silver halide products. 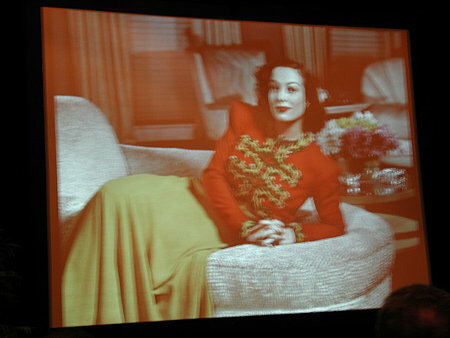 Fourth, he urged the industry to support the "Photography Culture." We thought it would be very interesting to have heard a Kodak executive argue points two and three. What was somehow reassuring coming from Fujifilm would, we suspect, have sounded like denial coming out of Rochester. His fourth point was touchingly illustrated with a short video of Yoko Ono repeating the phrase "Photo Is" and then pronouncing a word (like "peace") in Japanese and in English as an image (usually of her and John Lennon) is displayed on the screen. Komori explained that as we try to capture important images in our life and share them, we make a contribution to society, making it a better place by sharing the things that are important to each of us. HP's Joshi had a hard act to follow, but he had props, too. He spoke about hearing his grandmother's stories as a boy and how limited the world of analog story telling is compared to all the options we now have. The urge to tell our own story has made digital photography main stream very quickly. Consumers appreciate the 1) choice, 2) convenience and 3) control digital imaging provides. 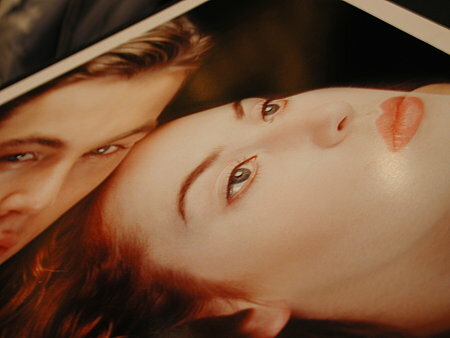 They can print at home, online or through a retail photofinisher, it's entirely up to them. But this transition from film to digital should be seen as a "tremendous opportunity" by the industry. "How can we get consumers to make prints?" is the question. The two big issues are ease of use and how the story is told. Ease of use is clear enough, but how we tell stories these days has been changed dramatically by the Internet. Software has evolved from an application to a service. We no longer buy computers to run Microsoft Word, we buy them to get on the Web and send email. The Internet empowers everyone globally to tell their story -- which is why, he said, HP acquired snapfish.com. Joshi said HP's attitude was to enable consumer's to tell their story by solving the technical problems that trip them up, rather than influence them to do things the way they can be done today. So the company that started in the home is branching out into the retail market with two new solutions. One is the Photosmart Express Station self-serve kiosk that uses a stationary print head to produce a 4x67 print in just five seconds (or 700 an hour). It's 40 percent more productive, he said, than current kiosks. 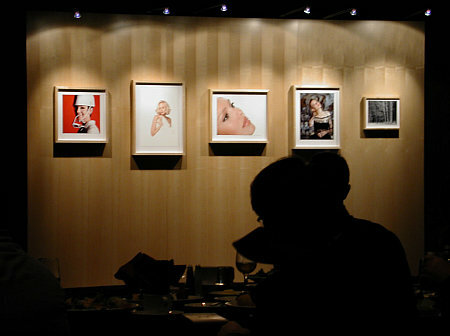 The second is Photosmart Studio, which goes beyond the 4x6 print to tell stories. That's where the props came in. A rug with the faces of members of his family woven into it. A book of images that tell, in sequence, a story that would have been lost in a pile of 4x6 prints. Urged on by this story telling cheerleading, we walked back to the hotel to take a nap. Which is more than we can say for the fellow sitting behind us at the keynote, who skipped the walk. His snoring caused several rows of alert observes to chuckle, persuading Joshi he was a far more amusing speaker than, in fact, he may be. We would caution him not to forego the props. Our own nap, conducted under the strictest scientific conditions (and enabling us to joke about it at 1:02 a.m.), preceded an Adobe press event we found particularly interesting. Adobe had some news to share. First, Photoshop Elements 4.0 for the Mac is ready for release. We spent a good deal of time making sure most of the Windows features we had liked were in the Mac version. Like simple masking where you scribble on what you want and don't want and Elements does the rest. And automatic red-eye removal that does not require you to do anything at all. There is not the same face recognition software the Windows version uses to tag people in images, but they haven't entirely given up on the idea, either. Second, Lightroom Beta has recently been updated and we got the cook's tour of the new features. Hierarchical tags was one reason Lightroom had to rebuild your image database on first launch. Even more interesting, though, Adobe revealed it will indeed release a Windows beta sometime this summer, prior to the fall launch. And then, we observed, all those nearly 3,000 Lightroom forum participants will be furious that they have to pay for a product that, really, they must already feel they own. We were assured Adobe is sensitive to that and is trying to think of some nice way to thank them. Because the feedback has been tremendously important to the company in the development of the product. It's hard to get beta testers who actually make much noise, it turns out. But the public beta actually had people redesigning the interface. And comments came from photographers Adobe often doesn't get much input from, like event photographers. So the product, like Photoshop itself, is taking on a life of its own. By sheer coincidence, we ran into three of our favorite O'Reilly authors there. Mikkel Aaland's Photoshop CS2 Raw has just come out. We reviewed Peter Krogh's The DAM Book in our Dec. 9, 2005 newsletter (http://www.imaging-resource.com/IRNEWS/index-arch.html). And we're about to review Julianne Kost's wonderful new book Window Seat: The Art of Digital Photography and Creative Thinking. We even ran into O'Reilly Managing Editor Derrick Story, who swore he was going to photoblog the entire PMA trade show floor tomorrow (but he neglected to share the URL). Not that would really put things in perspective.